What links the heart, a wick, and a sense of duty; or religious austerities with a column of print? David Galef finds character in Japanese characters, and narrative in the bridges between their definitions. The short pieces in Kanji Poems take us on a journey to a Japan of many times and places. 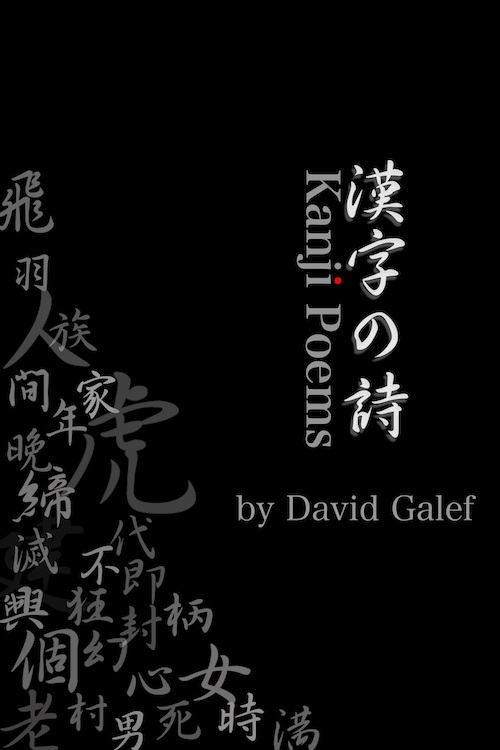 David Galef’s Kanji Poems is a delightful playground of surprises. Each poem begins with a kanji definition, and the various, often contradictory meanings give rise to image-rich, word-chewy, corner-turning poems. Kanji 4105, for example, is a character with the meanings “tiger; drunkard.” The two confront each other in Galef’s nimble mind, birthing a poem that concludes, “As they pad along / the street, one of them growls.” These are wise, sly, inventive, very funny poems. These economical and self-contained poems, which begin as improvisatory riffs on Nelson’s Japanese-English Character Dictionary, morph into something stranger, at once exotic and disquietingly familiar. “I am on the verge of becoming/something else: a pocket flap,/a straw curtain in the wind.” Kanji Poems is an unforgettable, wholly original collection. Frank and honest, these lovely poems draw from a character dictionary to share how human experience is revealed both in narrative and the material of language. Galef’s poems signify creative lexicography at its best…. The fun of Galef’s poems derives from the pleasures, the game, of watching such transformations occur.